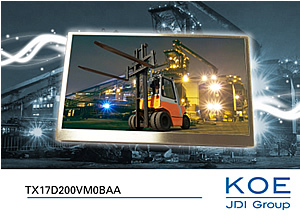 Industrial LCD manufacturer KOE Europe has announced the introduction of a new 6.5-inch Rugged+ TFT display. The TX17D200VM0BAA features IPS (in-plane-switching) technology which provides exceptional optical performance, a 16:9 wide aspect ratio and WVGA (800 x 480 pixels) resolution. Rugged+ displays are designed to provide a high performance display solution for the needs of high reliability and harsh environment applications. Wide viewing angle performance and consistent colour saturation are features of the TX17D200VM0BAA with the latest implementation of IPS technology. Viewing angles of 85 degrees are supported in all directions (up, down, left, right). The white LED backlight has a 70K hour half-brightness lifetime and provides a 700cd/m² brightness specification. A contrast ratio of 600:1 ensures that display images are bright, clear and uniform. Mark Stephenson, KOE Europe, Technical Marketing Manager commented, "The new 6.5-inch Rugged+ display should prove to be a popular addition to the KOE display portfolio. The size, resolution and aspect ratio of the display combined with the excellent optical characteristics leads to a highly versatile display module that will find use in many different applications and environments." Reliable and consistent operation under extended temperature, mechanical shock and vibration are a necessity in more challenging environmental conditions. The ruggedized 6.5" TFT is designed to function reliably under rigorous operating conditions found in some industrial, marine, aerospace and medical applications yet still provide exceptional optical performance. Support for harsh environments is aided with an operating temperature range of -30°C to +80°C and a storage temperature range of -40°C to +90°C. The TX17D200VM0BAA features a 20-pin LVDS data interface supporting 6-bit RGB which enables a colour palette of up to 262,000 colours. The 6.5-inch display module has mechanical outline dimensions of 154.8mm (w) x 92.7mm (h) x 10.2mm (d).